Shri Simha was born in China and by the age of eighteen was already a great scholar of the five sciences. In a vision, Avalokiteshvara instructed him to go to the Sosadvipa charnel ground in India where he would attain enlightenment. Pleased to hear such a prophecy, Shri Simha decided he needed to study further in order to prepare for his pilgrimage to India, and so he travelled to the sacred mountain of Wu T’ai Shan, where he studied different Tantras for seven years. He then took ordination and maintained monastic discipline for thirty years. Avalokiteshvara appeared to him again and repeated his advice. 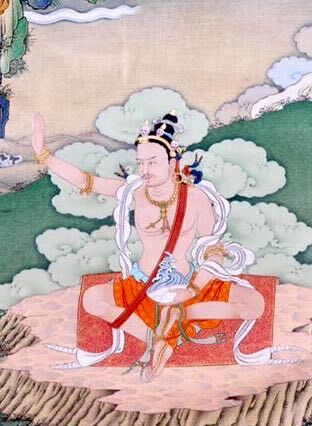 Before departing for India Shri Singa engaged in a practice that resulted in achievement of miraculous powers, allowing him to travel to Sosadvipa very quickly. He met Manjushrimitra there and studied and practised with him for twenty-five years. According to some sources, Shri Simha also studied with Prahevajra directly, later transmitting the teachings to Padmasambhava and Vairotsana. When Manjushrimitra achieved the rainbow body, Shri Simha received his master’s final testament, Gom-nyam Trukpa (The Six Experiences of Meditation), in a casket the size of a fingernail. Realising the essential meaning of Dzogchen, Shri Simha was able to withdraw the texts Manjushrimitra had hidden in the rock near Bodh Gaya. Upon his return to China, he arranged the Me-ngagde teachings of Dzogchen into four cycles: Outer, Inner, Secret and Innermost Secret (Nyingthig, or Heart Essence). He then hid the first three cycles of teaching near the Bodhi Tree Temple in China, and concealed the Nyingthig cycle in a pillar in the Tashi Trigo Temple, entrusting them to the Dharma-protectoress, Ekajati. After this Shri Simha lived in the Siljin charnel grounds in China, meditating and giving teachings. He bestowed the first three cycles of Dzogchen Me-ngagde on Vimalamitra, and all four cycles on Jnanasutra. As Shri Simha achieved the rainbow body his final testament, Zerbu Dunpa (The Seven Nails), descended into the hands of Jnanasutra.